From little old abuelas, to raucous family gatherings, from Rockeros* with their rats, (yes really with their pet rats, see the video below to see what I’m on about) to teens on their first date, an ice cream at Coppelia is quite the Cuban institution. Built in 1966 on the corner of La Rampa (23) and L in the Vedado district of Havana, the building is a monument to the futuristic and space age architecture of the era, with its flying saucer tower at the centre. Cubans gather to eat, chat, gossip and flirt at Coppelia. I like it because it’s one of the few places that I don’t feel like a tourist in Havana. I frequently go with Cuban friends and I always take visiting friends from Ireland to give them an insight into the real Cuba. It’s a great place for a first date or any date for that matter. Fortunately, Coppelia is two blocks from my house so I don’t have to run the gambit of public transport to get to it. Unfortunately, it’s nearby location makes it all too easy to pop out for ice cream on an increasingly frequent basis. Coppelia is open from 10am until 10pm Tuesday to Sunday but be warned there are nearly always long queues. Knowing how to queue in Cuba is an important skill; Coppelia elevates it to an art form. Here is the way I queue at Coppelia. Firstly, I walk around all the entrances to see which queue is shortest; each line is for a different location in either the garden areas, counter or the flying-saucer shaped upstairs. I don’t really have a preference for seating area so always opt for the shortest queue. Though do be warned, as the shortest queue can be deceiving as people may be queuing in place of their friends. So just when you thought there are only four people ahead of you, hey presto ten more arrive to join the person at the head of the queue! Next you ask for el último (the last) and either stand behind them, or stand in the general area of el último, making sure that you know where your place is. I generally make note of how el último is dressed and whoever is in front of them just to be on the safe side. Because when it get close to the time to be admitted the queue will bunch up and it’s easy to mistake your place. In Cuba, nothing starts a row quicker than queue jumping, except maybe baseball! Now it’s just a matter of waiting. 2. Water, queuing in the sun is thirsty work and I just don’t trust the quality of the glass of water they give you with your ice cream inside. 4. A newspaper. You can pick one up at the bus stop across the road. A newspaper has a dual function. Firstly, for reading while in the queue – there generally isn’t much chatting amongst other queue members and to wrap the plastic container to keep it cool while I walk home to my freezer. As you near the top, the queue directors will let you know where you may be seated. If you’re alone or in a pair be prepared to share a table with a stranger and you’ll be expected to vacate your table as soon as you’re finished. There is no lingering here as hundreds are waiting outside to get in. A creature of habit, I always order the $5 peso ‘ensalada mixta’ (mixed salad), which comprises of five scoops. If you’re looking for a smaller portion you could go for ‘Jimagua’ (twins) two scoops. But there are options from one to five scoops. Most Cubans I know will have at least two ensaladas mixtas and it’s not uncommon for a family to order twenty ensaladas mixtas to share. Many, like me, order again just before they leave so that they can take it home. On a recent visit a woman nearby ordered sixteen ensalada mixtas. Five of which she ate at the table, the other eleven I saw her put into her container which was housed in a very glamorous black handbag. Watch the video above to see her stuffing her handbag with ice cream! The flavours available at Coppelia vary on a daily basis. Usually there are at least three flavours but can be up to six or seven on a good day. My favourite flavours at Coppelia are those that I hadn’t tried before coming to Cuba. I find any more ‘normal’ flavours like Fresa** (strawberry) or Chocolate, unintentionally get compared to the food memories in my head, and they never taste as good. So now I create new food memories by trying the flavours like Almond, Pineapple and Coconut. If you go early, generally before lunch, you’ll have a good choice of flavours as they tend to run out in the afternoon. Also you’ll be more likely to get cake and biscuits with your ice cream. Personally, I ensure that I always have biscuits by buying a $5 peso pack from one of the many street sellers outside. Coppelia is always extremely busy in summer. Even in winter you will still be queuing, the video above was taken in January and you can see that every table is occupied. However, I discovered during the most recent rainy season that Coppelia doesn’t have long queues on rainy days. So my tip is head for ice cream when it rains! 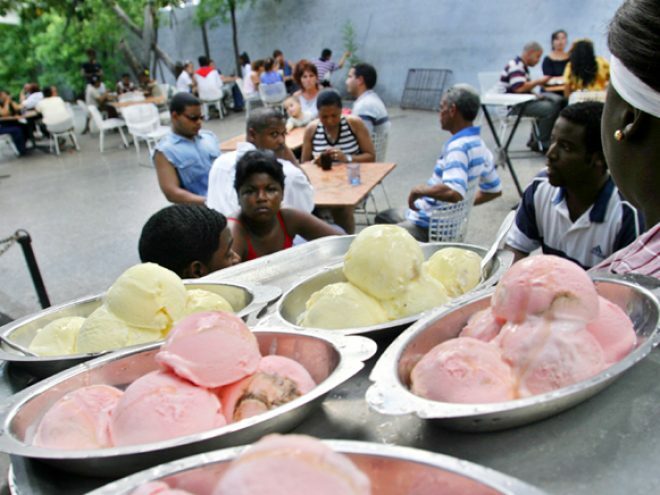 At the moment I’m working on home-made ice cream recipes using the ingredients available in Cuba. While I don’t think I’m going to challenge Coppelia’s dominance in the ice cream market any time soon, it’s fun and challenging to find ways to make ice cream without the difficult to get your hands on, milk or impossible to get your hands on, cream. I’ll share my ice cream making adventures with you soon! *Rockeros – term given to people who follow rock music.